Lara, Timmy, and Oma went on a trip today to the mission at San Juan Capistrano. I just posted the pictures, so be sure to check them out in the photo gallery! I also posted a second album of a random assortment of pictures from my iPhone this month. 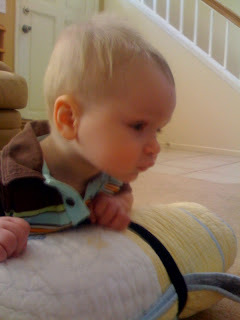 Also of note, Timmy has not puked in almost a week now - not once since Oma has been here. I think may be the first week without puking since he was admitted to the hospital in early July. Clearly his tube is now in the right spot and he is being fed an amount that is pretty appropriate for him! Lastly, our nurse that started this week is fabulous. She is patient-centered, good at getting Timmy to sleep (although none of us have been very good at helping him to stay that way), and she sends text messages to let me know how he is doing when I am out. So hopefully we can keep her around! After I posted about sleep deprivation last week, our neighbor was able to come over and rock Timmy while I got a 2 hour nap. Yay! 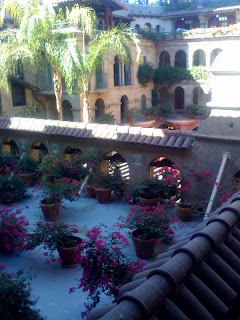 Then we had our getaway at the Mission Inn on Friday night. Yay! Then on Saturday, we got a last minute visit from my mom (aka Oma). She has just been fabulous — helping with the sleep deprivation and the general household organization. She is here for the remainder of the week. Yay! Then today our new dog-friendly home health nurse started. If all goes well, she will join us 3 times a week so that Mama can get a break and get the necessary chores done. So far I like her. Yay! Also, last night Timmy slept through the night again. Yay! Please pray for Mama and Timmy for continued healing from colds and that Timmy will continue to sleep through the night so that we can ALL feel better soon! One night of relaxation and uninterrupted sleep. The sleep deprivation around here is reaching epic proportions. We will be out at an appointment in the morning, but if any of our healthy, existing SoCal friends are available for 3-4 hours or so starting around 11 AM or noon to come by to just rock a child so that we can both sleep, that would be SO appreciated. Call or text me after 7 AM, or email me any time. Otherwise I will call around to find someone. Thanks. Praise: Timmy's overall strength continues to improve. He seems to be doing more and more standing lately. Prayer request: We are struggling to get sleep. Timmy woke up at 3:30 AM feeling uncomfortable and puky. He startles at every little sound and did not nap longer than 10 or 15 minutes all day. He fell asleep at bedtime but then woke again shortly thereafter. Right now he is asleep in my arms and he is due for a med so I am going to have to try to put him down soon. But we both really need him to sleep at night and nap in the day. Even just at night would be great. Also we have a nurse who will be helping us out Mondays, Tuesdays, and Wednesdays. Please pray for discernment and good relationships. Just wanted to confirm that we did make it home yesterday. Timmy still is having a bit of trouble keeping things down, but the new tube is working much better. His tummy contents do not look formula colored, so that means that it's doing its job and keeping the food in the intestines and not the stomach. He's having good diapers, so hopefully the puking will subside a bit once his body recovers better from the surgery. I must say that as much as I don't like to be admitted to the hospital, staying the night in the ER is worse. It is just impossible for a kid to sleep, which makes it impossible for a Mama to sleep either. We actually did manage to both fall asleep at one point, but then they woke us up to switch rooms, and the rest of the night was pretty miserable with an overtired Mama and child. Timmy was up almost the whole night, and then when they went to sedate him it took 4 doses and I still don't think it worked very well. He was just so wired from insufficient sleep that it worked against the sedation for the procedure. They said that he clenched his jaw and refused to open his mouth to put the scope down it, so they really had to force it. Poor kid! We had private rooms both times. They got the IV in one shot! And it was the same nurse who de-clogged the feeding tube a couple of visits ago. She used a hint from our nurse friend on where to look and right away she got it. Praise the Lord! As we were waiting, Marshall and I were sitting there reflecting on how rare it is to come across people who are familiar with mitochondrial disease. Then the resident walked in. We had never met her before, but she said that she is a friend of some friends from church and she has been praying for us and has visited this blog! What a blessing that was! It was just really an encouragement. Please keep praying for us as we look for a home nurse. 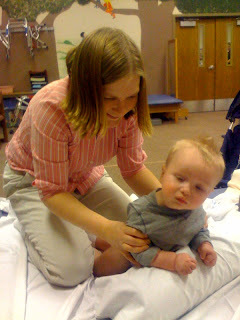 The first nurse we had was only here for one day and found a full time placement elsewhere. Since then we have had the trainers come in as subs, and they are wonderful — but we can't keep them! The x-ray yesterday came back that there were no blockages in Timmy's digestive system but the J tube was pulled quite close to the stomach. 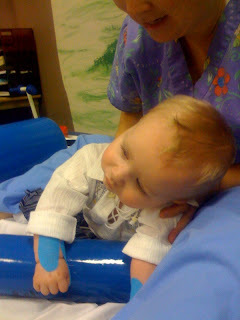 Today they replaced the tube (AGAIN) with a longer one that will hopefully stay put better. Right now we just restarted his feeds and we are attempting to make sure that he will wake up OK from the anesthesia. Then hopefully we will head home. While we have had some small poo diapers, they have been just that — small. We are headed to the ER. I have been pumping lots of pedialyte through Timmy's tube, and we picked up Timmy's prescription for erythromycin as well as some baby laxative. We also have permission from the GI doctor on call to give 1-2 ounces of plum juice per day. So far I gave the laxative and the erythromycin, and we did have a medium sized dirty diaper. So I am still hoping for more, but this is a great start. Now we work on getting him good and hydrated and we see if we can re-start the formula and get some calories and vitamins back into him. I was just curious to know if any of you who read our blog know of how we could "upgrade" this papasan chair for a bigger kid version. 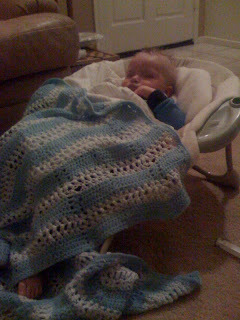 Timmy is quickly outgrowing it, but it is a lifesaver during those times when he doesn't feel good for some reason and we want him to be in a comfortable place close to us where he can fall asleep when he is ready. Actually, if you know of a bigger kid infant swing, I would be interested in hearing about that as well. San Diego (or not), baby carriers, etc. 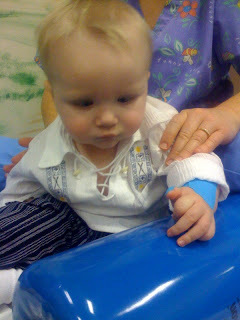 Well, we had a post-hospital follow-up with our regular neurologist on Wednesday afternoon. He said that the test we were heading to San Diego for could be done at the lab at our local hospital. So at the last minute we called the doctor on call in San Diego to see if we could do it that way. He agreed, so we stayed home after all. Marshall is still taking the couple of days off to catch up on some projects at home. The neurology appointment went well. We were the last patient of the day, and the doctor really took his time to answer questions and listen to what I had to say. He agreed with me that it seems likely that Timmy's "seizures" were probably a really bad reaction to being WAY overfed and on some meds that didn't agree with him, and we are starting to wean him off of his seizure meds. This is fabulous because they seem to upset his stomach so hopefully he will start to sleep better and feel more comfortable in the upcoming weeks. The bad news was that he suspects that Timmy is starting to develop signs of tunnel vision, which could potentially lead to blindness down the road. This is somewhat common for Leigh Syndrome kids, but it is a big fear of mine -- especially since he does not have the strength to move around much, and he seems to enjoy books. So I need to make an appointment with the eye doctor next. Maybe more vitamins too? On a more positive note, my Bible study small group pitched in to buy us a new baby carrier. It arrived yesterday and I love it already. Just tie and go! No buckles or leg slots to maneuver. 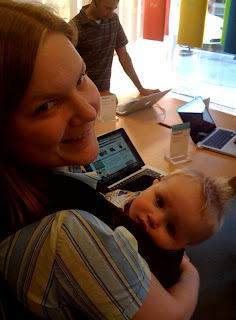 We walked around the outdoor mall this afternoon (stopping of course at the Apple Store to look at the new laptops) and as it got dark, Timmy fell asleep in it. Yay! Timmy's coordination continues to improve. 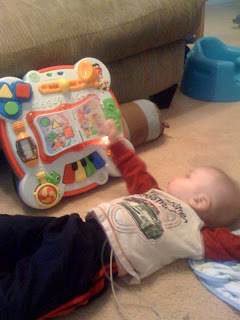 As you can see, if I lay him next to his musical table, he actively plays with it. Despite some threats, my own health seems to be doing well overall. The doctor has approved us to not give the medicine that was making me have to get up in the middle of the night. We were given a gift certificate to the Mission Inn and we have some dear friends who have agreed to watch Timmy overnight so that we can get away for a night next weekend. Timmy has not had any seizures since we have been home. For wisdom as we decide about what and how much to feed Timmy and what meds he needs. He has an extremely sensitive tummy. Vomiting continues to be an issue. Please pray for wisdom on how to keep it at a minimum. Please also pray that his lungs would be protected from pneumonia caused by the vomiting. That we would find just the right nurse to give Mama a break - someone wise and kind and dependable. For my health - especially for my endometriosis and some dental issues that may require more surgery. For sleep for all of us. For traveling mercies as we head to San Diego tonight for some blood tests tomorrow. For continued protection from seizures. This physical therapy stuff is hard work! Today's session focused on critiquing Mama's technique. Ok, so this is a horrible, blurry picture. But look at what Timmy is doing! 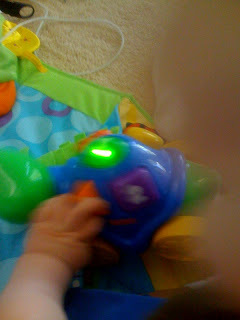 He is sitting (with some help but still doing it nonetheless) and hitting the buttons on his little turtle! HE hit them. I didn't have to do it for him. Yay!! We also used a scooter to push off in a crawling position. 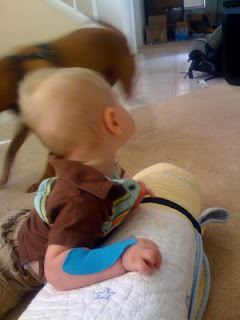 Today in therapy we practiced side sitting using a bolster for support. Check this out! Timmy was watching Brutus chase after his ball.